Alesis are no strangers to electronic percussion, having produced such pioneering products as the first affordable digital drum machine, the HR16, and the award-winning SR16 — released, amazingly, in 1990 and still selling today. Over the years, they've covered almost every kind of studio product, but you might not have realised that they've been a significant force in the electronic drum market for quite a while now, and currently ship nine kits. The newly updated DM10 Studio fits in just below the top of the range DM10 Pro, and includes the same RealHead drum pads and DM10 brain module as the flagship kit. The DM10 Studio comes with four eight-inch tom pads, a 10-inch snare pad and an eight-inch kick-drum pad. There are two 12-inch crash cymbals, along with a 14-inch ride and a 12-inch hi-hat. All the drums and cymbals attach to the new 'Stagerack' system, apart from the free-standing kick drum. The Stagerack is one of the 'new for 2011' features of the DM10 Studio, and appears to be a significant improvement on the previous Stealth Rack, in terms of both stability and construction. Based on a sturdy four-post system, the aluminium rack is held together with familiar-looking clamps which, although made of plastic, do the job perfectly well. The drum pads themselves attach to the rack with similar clamps, this time with wing screws, so you can easily adjust their position without reaching for your drum key. The kits I've looked at in the past (admittedly more expensive ones) use a standard snare stand rather than attaching the snare to the rack, which is not the case with the Alesis. I was a little concerned that positioning the snare exactly where I wanted it would be difficult, but I couldn't have been more wrong! The clamp allowed for an amazing degree of movement, and the same was true of the hi-hat pad, which again connects to the rack system rather than having a stand. The arms that support the two crash cymbals are proper, chunky boom arms, and slot into the main upright post of the rack. This is another upgrade on the 2011 version of the kit and is a welcome change from more fragile offerings I've encountered. The ride cymbal is supported by an equally sturdy straight cymbal stand, giving the whole kit a very solid and professional look. The DM10 Studio's heads can be swapped out for the heads of your choice.The only potential weak point would be the kick drum, which is entirely free standing. As it's comparatively light, it did have a tendency to move a little if played hard, but it's nothing a little gaffer tape wouldn't solve (and bass-drum creep is nothing new to most drummers). The alternative would be to fix the kick to the rack, but that would limit the positioning of the pad and might lead to some cross-triggering through the rack. The DM10 brain module mounts neatly on the left arm of the rack, with pads connected to it via a colour-coded, clearly labelled loom. Cable lengths are even tailored to reach each drum with minimal slack. This is a nice touch, but does mean that you're limited to the module mounting on the left. All the drum pads (apart from the kick) are dual-zone, featuring both rim and head triggers. They are made from a plastic tray onto which one of the two piezo pickups is attached to capture drum triggers. A shallow wooden drum shell with bearing edge and black plastic wrap sits on the tray and is filled with layers of foam. The second piezo pickup is mounted on a metal plate attached to the underside to take care of head triggers. 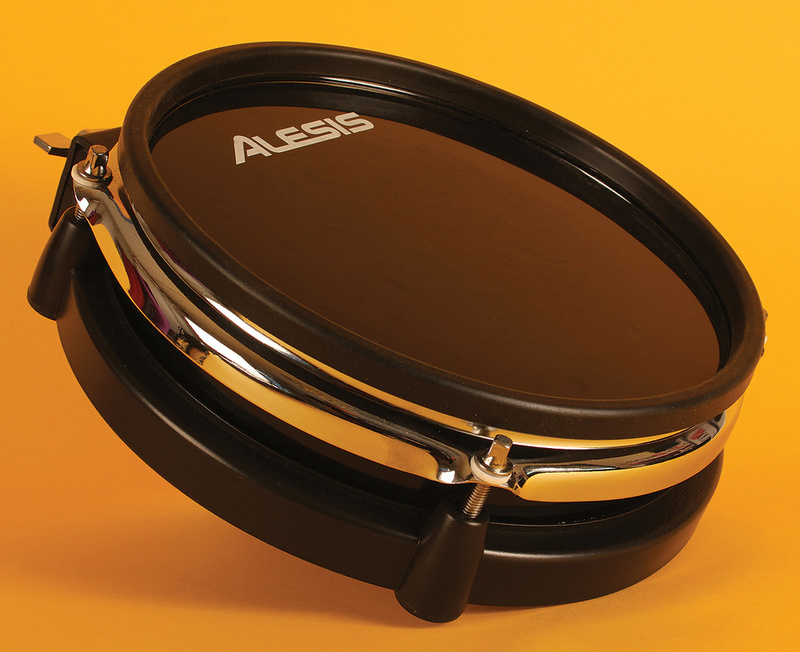 An Alesis-branded black Mylar drum-head fits over the shell and is held in place with a regular drum hoop, then a rubber ring fits over the hoop to reduce the impact and noise of rimshots. This acoustic drum-style construction results in a great-looking pad that can be tensioned like a real drum to suit your playing style. I found the standard heads a little hard and unforgiving. but as you can fit any standard drum-head (including mesh heads), there's plenty of scope to change them. The DM10 studio ships with three types of cymbal, plus a hi-hat. All are constructed from hard black plastic with a softer rubber coating covering just under half of the playing surface. This improves feel, and also significantly reduces stick noise. The crash cymbals are both 12-inch, single-zone cymbals, but one lets you choke the sound by grabbing its edge. It's not the best electronic choke I've heard... but it does the job. The Ride cymbal has three trigger zones (edge, bow and bell) and works extremely well. It's possible to move very smoothly from the bow of the cymbal to the bell, and even crash the edge, followed by fast hits on the bow and bell, without notes cutting short. The hi-hat is another single-zone, 12-inch pad and mounts directly onto a fixed cymbal arm. Control of the hi-hat is via a remote, continuous controller-type pedal connected to the brain module. This can give a slightly unnatural, detached feel when you're playing the hi-hat, as there is no movement from the cymbals when you're 'opening' and 'closing' the pedal. Nevertheless, it works well and allows for a smooth transition from a fully closed, tight hi-hat to an open and splashy sound. The DM10 Studio's control module. This well-featured, clearly laid-out module has a rear panel crammed with jack sockets. There are 12 trigger inputs, labelled for the individual drums, and the kit uses all but one of these, with the four 'PERC' inputs accommodating the additional tom and cymbal pads this kit configuration offers. Two Main Out sockets and a further two Aux outputs are provided on quarter-inch jacks, and there's a pair of phono Aux inputs to bring in external sources such as CD or MP3 players to play along to. It appears that there's no facility to adjust the volume of the input on the module itself, so this would need to be done at source. MIDI In and Out sockets and a USB socket for direct connection to a computer complete the selection of I/O, and power is provided via a 9V adaptor that's a cross between those horrible wall-wart affairs and a regular IEC mains lead — so you end up with a small connection into the module but a solid threetwo-pin plug. The front panel has a surprising number of knobs, faders and buttons for a kit in this price bracket. A large backlit LCD sits in the centre of the panel, with four Function buttons below it corresponding to whatever the display is showing. A large value wheel, along with up and down cursor keys, enable easy, fast navigation and data entry. There are transport controls for the built-in sequencer, a large tap-tempo button and two up/down data-entry buttons. These duplicate the data-wheel function but are better suited to small parameter adjustments. Dedicated buttons in the centre of the panel give direct access to the Utilities Menu, Trigger options, Instrument and Accompaniment edit pages. I particularly liked the large 'Drum Kit' button, which takes you straight back to the main Drum Kit page from any other edit page — a kind of 'take me home' panic button! Finally, on the left of the module are the level controls, comprising individual Main Out and Headphone volume knobs plus an impressive six-fader mixer section to adjust the level of each drum. The mixer has two banks and you can flip between them using the Mix Bank button, to access all the drums, metronome and accompaniment levels. This allows for very fast and easy balancing of the individual elements within a kit — a very welcome feature and something I've previously only seen on more expensive kits. After the initial splash screen, the DM10 display defaults to its main 'Drum Kit' screen, which shows the kit name, number, and a large graphic representation of the type of kit selected. Across the bottom of the LCD are 12 'doughnut' shapes that represent the head and rim triggers of the pads and these 'light up' as you hit each pad, which is very handy for seeing which pads are being triggered and to help you sort out any problems. When I first started playing, I was experiencing some horrible cross-triggering from the pads, with cymbals ringing out each time I hit a tom pad, and the percussion noises assigned to the rim triggers making all sorts of unwanted sounds. After a quick look in the manual and some judicious tweaking of the trigger parameters, the DM10 Studio began to behave. Fortunately, this very comprehensive set of parameters enables you to perfectly configure the DM10 to your playing style. As I mentioned earlier, the main screen displays a graphic representation of the current kit, the first (000) being 'Fusion', represented by a fairly regular-looking five-drum kit. This great-sounding acoustic kit shows off the DM10 beautifully: the snare is bright and solid sounding, with a really nice natural ring, and the rimshot sound really barks. I was very impressed with the sensitivity of the 10-inch snare pad. It was able to reproduce some very quiet grace notes and coped with a buzz roll remarkably well. All the 'acoustic' kits are of a similar high quality, with some really great-sounding individual drums, particularly the snares. The eight-inch pads appeared a little less sensitive and didn't quite pick up some of the very light touches, but the drum sound assigned to the pad also had a bearing on this. In general, the snare sounds are more sensitive to the grace notes and lighter playing than the toms, which is how you tend to play a kit anyway. The Cymbal pads, if a little uninspiring, due to being only single-zone, perform surprisingly well. The three-zone Ride cymbal does the best job of all the cymbal pads, as it allows for more variation when playing than the single-zone crash cymbals. The on-board 1047 sounds are all built from 16-bit, uncompressed samples of real drums, cymbals and percussion. Each sound is composed of a series of samples at different velocity levels, triggered appropriately via Alesis' Dynamic Articulation technology. As you play harder or softer, the drum or cymbal changes its timbre, not just its volume, which produces realistic and impressive results. There are 199 kits in total (99 Factory Presets, plus 100 Empty locations), with preset kits more than covering all the bases, ranging from well-recorded acoustic kits in natural ambiences through hard-hitting dance and techno kits to ethnic and 'new age' collections. The Preset kits can be edited and overwritten, and the module offers extensive editing capabilities. In addition to the natural acoustic kits, Alesis have provided a wide range of electronic kits and percussion palettes that take full advantage of the DM10's ability to assign different sounds to the rim and drum heads. It's within these more esoteric kits that Alesis can showcase a few of the DM10's other interesting features, like the ability to layer two samples. This can be done on both the rim and the drum head, so in theory you can assign four different samples to one pad. Each sample can then have a different velocity trigger point, enabling some really great effects. The back of the control module features 12 trigger-input sockets on quarter-inch jacks, MIDI In and Out ports, a USB port, aux ins (on RCA phono jacks) and outs (on quarter-inch jacks) and stereo audio outputs, again on quarter-inch sockets. I've already touched on the DM10's ability to stack two samples on both the head and the rim, but that really is just the tip of the iceberg. From the Drum Kit page, hitting the 'Edit Inst' button takes you to the Instrument Edit page, where you can choose to edit Instrument, MIDI or effects. Pressing 'INST' brings up another nice graphic, this time of the currently selected drum or cymbal. Pressing the Note Chase button lets you select the Instrument you want to edit by simply hitting that pad, rim or cymbal. The instruments are categorised to make selection easier: Kicks, Snares, Toms, Hi-Hats, Crash, Ride, China, Electric Kick, Electric Snare, Electric Toms, Latin Perc, Ethnic Perc, Oriental Perc, Orch Perc, Electric Perc, Random, Bass, Synths Bass, FX and Hits... Phew! Once you've selected your category, you select the instrument within it, from 91 Kicks, 85 snares, 69 Toms, 36 crashes, 28 Rides, 25 hi-hats, 13 Chinas, 151 assorted percussion sounds, over 100 drum machine and beatbox samples, plus 55 basses and 349 'Hits' (which are primarily used for the accompaniment parts). The 'Random' section deserves a special mention, as it includes a selection of samples that rotate, well, randomly as you hit the pad. For example, you can select a group of conga and bongo hits that create a great pattern as you continuously hit the same pad. Once selected, each Instrument can be given its own Level, Pan and Decay setting, with coarse and fine tuning also available. I had great fun playing with some of the options on the Dynamics page. The Vel> Decay, Filter, Level and Pitch parameters enable you to set how the instrument will respond when struck at different velocities. For example, Vel>Pitch will adjust the pitch of the sound (up or down) depending on how hard the pad is struck. This can be used to great effect creatively, by taking the parameter to extremes, but also to subtly recreate the way a real drum reacts when struck in different areas of the head. The effects section of the DM10 is extremely comprehensive, as you might expect from a company of Alesis's pedigree. Each instrument has the option of reverb, compression and EQ, plus a second effect. Reverb algorithms range from warm studios through to endless spaces, each with Size, Level and Colour Parameters, and compression is applied via 14 'types' with descriptive names such as Rok, LoBoost, Radio and Master. Each compression type has a compress (ratio) setting and an Output level setting. EQ is catered for with low and high bands, each sweepable from 20Hz to 18.5kHz, with cut or boost from +12dB to -60db! The DM10 module has yet another major trick up its sleeve: a built-in sequencer with full editing capabilities. Shipping with 75 preset sequences and 25 user sequences (all overwritable), the sequencer works as a method of playing back 'demo' songs to jam to and as a tool for recording and editing your own playing. Each sequence has an A and a B part: Drums and Accompaniment. Each part can be quickly muted via its own mute button, so it's very easy to silence the drums in a preset sequence and play along to the accompaniment. These accompaniments use a selection of real audio samples from the 'Hits' instrument category, so they sound pretty good and are certainly fun to play along with. They still have that slightly cheesy 'keyboard demo song' air about them, but as an alternative to just playing along with a metronome, they're certainly welcome. The first Function key on the module lets you access the Record page, where you can select the Drums or Accompaniment track to record on and also whether you want to Record or Overdub. The DM10 transport controls take over at this point, whereupon hitting Record gives you a one-bar count-in. Once you're done, you can press Play and immediately hear your performance back. That in itself would be a great feature but there's more. The second Function key brings up the Edit page, where you can view the recorded sequence in a grid format for the drums or a list editor for the accompaniment. In a familiar style, grid edit lists drum voices down the left, with the drum hits/events/notes represented by little diamonds on the bar lines. Using the F3 and F4 function keys, you can step through events one at a time, or use the scroll wheel to scrub at speed. Once you find an event you want to edit, you can toggle between Velocity and Time position using the Function 2 key and change the event's value. It's also possible to globally quantise all events. I'm not really sure why you'd want to edit the accompaniments in the DM10, but the provision is there to view the accompaniment tracks in list-edit format and edit bar position, note value, velocity and duration. The DM10's comprehensive MIDI implementation means that the kit lends itself very well to being integrated with an external sequencer or DAW. 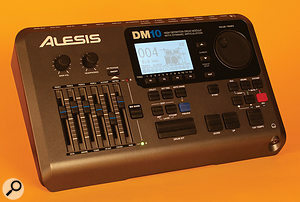 The USB port enables connection directly to a computer, without the need for a MIDI interface, so the DM10 can be used as a sound source or a trigger input device for software drums such as BFD or, indeed, both. The ability to set up and record a real acoustic drum kit is a luxury most of us don't enjoy. Having this kit in your studio is not going to completely replace well-recorded real drums (you won't be denying Steve Gadd any session work), but for the home studio owner looking to go some way towards capturing the performance and sounds of real drums on their recording, without breaking the bank, the DM10 Studio may well be the answer. The realistic feel of the drums, with their Mylar heads and familiar construction, combined with the impressive-sounding kits and the natural way in which they play, results in a setup that a drummer wouldn't find 'alien'. It would be unfair, given the price tag, to expect the DM10 Studio to match up to the top-end offerings I've previously looked at, but it's a big step up from the entry-level electronic kits, in terms of build quality, sounds and features, and it certainly looks the part. Factor in the extensive palette of electronic and world percussion at your fingertips, the effects, and the ability to completely change the entire sound set, and for under £700 $999 this kit looks like a real bargain. 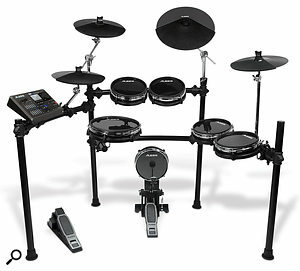 In a similar price bracket to the DM10, you could also consider kits like the Alesis DM8 Pro and DM10 Pro, the Yamaha DTX500K and DTX520K, and the Roland TD4k2 and TD4kx2. Should you ever tire of the 1047 sounds of your DM10 module, it's heartening to know that Alesis have this covered! An entirely new sound set can be loaded in via USB, though the only set currently available is the Sonivox Blue Jay Studio Drums, a download from the Alesis web site costing $49. Note that the DM10 only allows you to change the entire contents of the module via this method, not individual drums. Kick drum could do with more weight. Cymbal choke not the best. Ten-inch pads appear slightly more sensitive than eight-inch pads. The features, sounds and construction of the DM10 Studio kit take it way beyond those of the entry-level kits, but at a very affordable price. Numark Alesis +44 (0)1252 896000. Numark Alesis +1 401 658 5760.